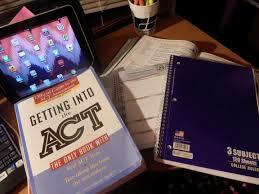 The ACT, or American College Test, that juniors must take during the spring semester is quickly approaching. Taking the ACT is one of the most important tests students will take during their time in high school. It is also one of the deciding factors which determines what college students will attend. All colleges have a minimum acceptance score and provide scholarship opportunities for those who excel on the test. Not only do students have to have a good score on the ACT but also a high GPA. Most students spend months preparing to take this test. Baker’s Hornet Block, ACT Prep, was designed to tutor students in critical areas. The University of South Alabama also offers ACT Prep classes. Books are available for students to purchase or check out to aid in their preparation process. When studying at home it is imperative to take practice tests with time limits. Students will need to know how to manage their time wisely on test day. The ACT offers a writing portion that many colleges have begun to require when applying. Go to bakerhighschool.com to view available test dates and registration information. It is recommended that students take the test before the required assessment date and multiple times for improvement purposes.